Studies indicate research ethics committee (REC) approval and clinician gatekeeping are two key barriers in recruiting children and young people (CYP) with life-limiting conditions (LLCs) and life-threatening illnesses (LTIs) and their families to research. Objectives To explore the reported experiences, difficulties and proposed solutions of chief investigators (CIs) recruiting CYP with LLCs/LTIs and families in the UK. Methods 61 CIs conducting studies with CYP with LLCs/LTIs and their families, identified from the UK National Institute of Health Research portfolio, completed an anonymous, web-based questionnaire, including both closed and open-ended questions. Descriptive statistics and inductive and deductive coding were used to analyse responses. Results UK CIs cited limitations on funding, governance procedures including Research and Development, Site-Specific and REC approval processes, and clinician gatekeeping as challenges to research. CIs offered some solutions to overcome identified barriers such as working with CYP and their families to ensure their needs are adequately considered in study design and communicated to ethics committees; and designing studies with broad inclusion criteria and developing effective relationships with clinicians in order to overcome clinician gatekeeping. Conclusions Many of the challenges and solutions reported by UK CIs have applicability beyond the UK setting. The involvement of clinicians, patients and their families at the inception of and throughout paediatric palliative care research studies is essential. Other important strategies include having clinician research champions and increasing the visibility of research. Further research on the perspectives of all stakeholders, leading to mutually agreed guidance, is required if care and treatment are to improve. Despite researchers being responsible for navigating these complex approval processes and many chief investigators (CIs) having several years’ experience in the field of palliative care, very little research has directly explored their views about barriers encountered and suggested solutions to overcome these. Chen and colleagues15 conducted an interview study of leading researchers in palliative care in the USA in order to explore barriers to research they had encountered. However, this work was not focused exclusively on studies conducted with children. Therefore, we conducted a scoping survey of PPC researchers at the 7th International PPC conference in 2015. This initial survey reported clinician gatekeeping and research ethics committees (RECs) as significant barriers to recruitment in this population and the full results are reported elsewhere.16 We used these data to inform the structure and content of a larger and more detailed online national survey to further our understanding. In this paper, we report on the UK wide online survey which collected data from CIs recruiting CYP with LLCs/LTIs and their families, with attention not only to reported barriers to research but also suggestions for solutions. An online survey was built using OPINIO survey software.17 As well as building on what we had learnt from the scoping survey of PPC researchers,16 the UK wide survey was also informed by a scoping review of barriers to research in palliative care with paediatric and with adult populations.9–12 15 18–25 That review identified six relevant domains: (1) ethical issues; (2) institutional capacity; (3) funding issues; (4) physician-related factors; (5) population factors and (6) recruitment and consent processes. The UK wide survey was drafted by the research team which included senior researchers experienced in conducting palliative care research in a number of populations including CYP and their families, as well as more junior researchers who are often responsible for navigating governance procedures and recruiting research participants. The draft survey was piloted by the research team among both junior and senior academic colleagues, including three statisticians, and was modified in an iterative process based on their feedback. Items were presented in a variety of formats including multiple response, Likert scale and open-ended questions. The final version of the survey included 28 questions and was divided into three sections collecting data on: (1) CI’s most recent project involving CYP with LLCs/LTIs/their families—including sections on ethical and regulatory approvals and researcher access to patients and families via clinicians; (2) CI’s experiences of research with this population in general; (3) demographic information on respondents. A copy of the survey is included in the online supplementary appendix A. The UK National Institute of Health Research (NIHR) Clinical Research Network (CRN) portfolio was searched to identify all CIs conducting studies with CYP (aged 0–18 years) with LLCs/LTIs and their families which were either open or closed (ie, collecting data) between March 2011 and 2016. There were no restrictions on methodology of included studies. Decisions on whether an illness or condition was considered to be LL or LT were guided by Hain’s directory of LLCs26 which includes International Classification of Diseases-10 codes. If there was uncertainty about eligibility, CIs were included initially as the survey began by asking whether respondents had been involved with a study that recruited CYP with LLCs/LTIs or their families over the past 5 years and automatically terminated if they selected ‘No’. Ethical approval was granted from the UCL Research Ethics Committee (UCL ethics Project ID: 8513/001) on 11 March 2016. Of the 257 CIs invited to take part, 71 answered the first eligibility question on the survey; of these 4 answered ‘No’ to this and 6 answered ‘Yes’ but then answered no further questions. Twenty-four per cent (61/257) of those who were invited to take part, did so beyond the initial eligibility question. Respondent characteristics are shown in table 1. Studies were diverse in nature and key features of these projects are summarised in table 2. CYP in the studies had a range of LLCs/LTIs, including for example cystic fibrosis, cerebral palsy, cancer and Duchenne muscular dystrophy. For the most recent project for which CIs had completed data collection, 44% stated that they experienced difficulties gaining R&D approval and 26% site-specific approval (SSA). Only 14% said they had difficulties obtaining REC approval (table 3). Respondents emphasised that it was both the complexity and duration of the R&D/SSA approval processes that made these processes challenging. Notably, 63% of CIs reported having to make changes after REC review when compared with 27% of CIs after R&D review (table 3). Forty-five per cent (18/40) of CIs found the changes to study conduct and materials required by regulators to be useful. For 45% (25/56) of respondents, it took >6 months to obtain all necessary approvals. Some clinicians act as gatekeepers and do not give families the opportunity to decline or accept a study (CI 10, researcher). Regarding their experiences in research with CYP with LLCs/LTIs and their families in general, the majority of CIs (51%; 27/53) reported that funding was the biggest research barrier encountered. This was especially true for those in a clinical (73%; 8/11) rather than a clinical and research (44%; 12/27) or solely research (47%; 7/15) position (figure 1). CIs views of the biggest barriers to research with CYP with LLCs/LTIs and their families. CI, chief investigator; CYP, children and young people; LLC, life-limiting condition; LTI, life-threatening illness. Our population had a lot of parents who either didn’t read and write in English or who had limited literacy in any language. I understand this to be common to many palliative conditions. In practice the written information on consent sheets and information sheets were not helpful in the slightest (CI 17, researcher). Consult with members of the communities you plan to involve… Record their opinions and include them in your application for ethical approval (CI 20, researcher). Design studies that will not exclude too many patients. This is very important in children (CI 33, clinician). Make sure you establish excellent relationships with clinicians and parent and patient groups well in advance of beginning your research (CI 27, researcher and clinician). The medical staff in my ’team' have NO interest in anything other than Clinical Trials of an Investigational Medicinal Product (CTIMPs) (CI 26, researcher and clinician). Interestingly, parents always wanted to participate…I would suggest all researchers should recruit for themselves and not allow clinicians to facilitate it at all as it can cause unnecessary gate-keeping (CI 17, researcher). 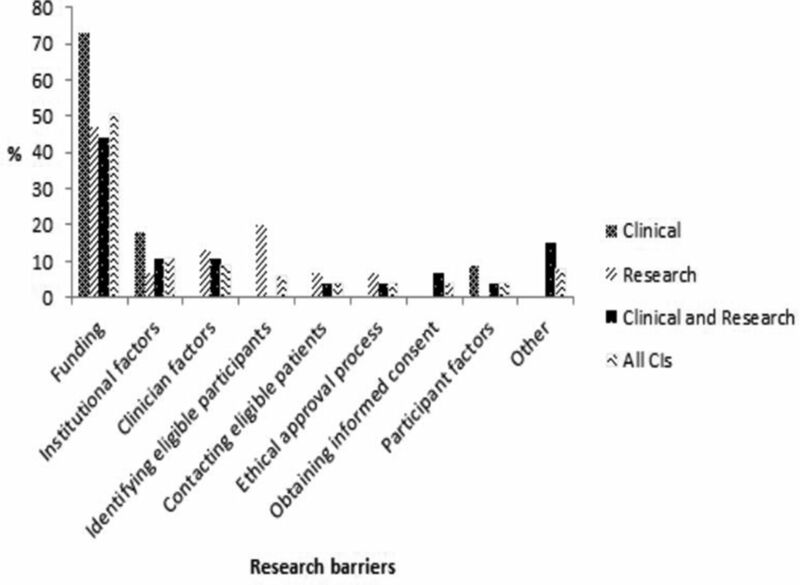 However, as highlighted by one CI, this is problematic where recruiting via clinicians is ‘an ethical requirement of the study’ (CI 19, researcher and clinician). We undertook this work to increase our understanding of current barriers to conducting research with CYP with LLCs/LTIs and their families, and to consider how these might be overcome. Our data reflect the views of CIs conducting studies in the UK with funds from NIHR or organisations that meet quality criteria for inclusion in the NIHR Portfolio (eg, Wellcome Trust, Cancer Research UK, The Health Foundation). As emphasised by the results, particular challenges arise in PPC research: opportunities for funding are scarcer both through mainstream agencies and specific calls, RECs may be apprehensive about approving work in this area and overloaded clinicians may also have anxieties about the appropriateness of some research work. CIs emphasised the importance of involving clinicians, CYP and families at the inception of studies and embedding researchers into clinical teams, in order to overcome some of the identified difficulties. The findings of this study in the UK are consistent with others exploring similar issues such as that by Chen et al reporting on results of a survey of US National Institute of Health funded CIs.15 This underscores how regardless of differences between countries and healthcare systems, problems encountered in this area are common. Unique to our study was the challenge that CIs raised with regard to the R&D approval process. It is unclear, however, whether these perceived difficulties are specific to PPC research and the extent to which such obstacles will have persisted since the establishment of the HRA and streamlining of processes in the UK in 2015. This is something that would be an important area for further study. However, as emphasised by CIs in our survey, even if clinicians are involved early on in the research process and researchers are embedded into clinical teams, recruitment via clinicians can still be a challenge.35 A review of interventions conducted to improve recruitment to randomised controlled trials found that the impact of interventions aimed at recruiters, specifically providing additional education, was unclear.36 We suggest the development of clinician research champions to facilitate research within their teams. When reporting work carried out with the active co-operation of clinicians, these individuals should be invited to contribute as full authors for peer-reveiwed manuscripts or at least be acknowledged within these. Use of research registers, publicising research on social media or university websites, and liaising with special interest groups for rarer LLCs and LTIs are possible mechanisms to increase the profile and visibility of research within society, so interested families can request to participate in studies. A further important strategy, adopted as part of a participatory approach to research in this study and in other research areas,37 is ensuring that there is a lay representative on the research team. The use of the NIHR portfolio to identify CIs meant that the scope of the survey could be nationwide. However, a ‘true’ population denominator could not be calculated as it was sometimes difficult to assess whether some CIs should have been included, for example, where there was limited information about the condition studied. By only using the NIHR portfolio, the perspectives of those who conducted studies without NIHR or NIHR recognised funding sources (eg, studies funded by some approved charities)38 were not included. The use of the portfolio to identify participants also meant that clinicians were likely to be over-represented in the sample. However, the number of highly experienced researchers in the study (n=61) provided a rich source of data for analysis. Conducting a survey that included both closed and open-ended questions provided depth and clarity in responses. This was particularly striking where CIs described clinician involvement with introducing the study to patients/families as positive in a closed question but in open-ended responses, variability in clinicians’ willingness to recruit participants to studies was highlighted. The authors would like to thank Dr Claire Nightingale, Dr Mizan Khondoker and Victoria Vickerstaff for statistical advice about the survey and Dr William van’t Hoff, Lizzie Chambers, Maggie Comac, Thines Ganeshamoorthy (PPI), Kate Hall (PPI) and Doug Hall (PPI) for their advice during the study design phase. They would also like to thank all the chief investigators who gave their time to complete the survey.
. Pediatric palliative care in 2014: much accomplished, much yet to be done. J Palliat Care 2014;30:311–6. HRA. NHS Health research authority. 2017 http://www.hra.nhs.uk/ (accessed 27 Apr 2017). UCL Information Service Division. Opinio. 2016 https://www.ucl.ac.uk/isd/services/learning-teaching/elearning-staff/core-tools/opinio (accessed 20 Dec 2016).
. Designing and conducting mixed methods research. 2nd edn: SAGE Publications, Inc, 2011.
. Qualitative research methods: Sage, 2010.
. Does research into sensitive areas do harm? Experiences of research participation after a child’s diagnosis with Ewing’s sarcoma. Med J Aust 2002;177:507–10. NIHR. Eligibility for NIHR support. 2016 http://www.nihr.ac.uk/funding-and-support/study-support-service/eligibility-for-nihr-support/ (accessed 20 Dec 2016). Principal investigator: Professor Myra Bluebond-Langner. Overcoming barriers to the study of children with life-limiting conditions and life-threatening illnesses and their families: Perspectives from a study of research ethics committees. Barts Health. BH 2016;52AZ95. Contributors JNP: selected appropriate CIs from the NIHR portfolio, disseminated the survey, analysed all responses and drafted and approved the final manuscript as submitted. EB: contributed to survey design, piloted the survey, collated feedback from experts, inputted the survey into OPINIO, started the selection of appropriate CIs from the NIHR portfolio, reviewed the manuscript and approved the final manuscript as submitted. LJMO and BFH: contributed to conception and design of the study, survey design, reviewed the manuscript and approved the final manuscript as submitted. PS, LJ and MB-L: contributed to the conception and design of the study, interpretation of results, reviewed the manuscript and approved the final manuscript as submitted. MB-L: secured the funding and led on the conception and design of the study, interpretation of the results, reviewed the manuscript and approved the final manuscript as submitted. Funding The author(s) disclosed receipt of the following financial support for the research, authorship, and/or publication of this article: JNP’s post was supported by Great Ormond Street Children’s Charity (G25 513947 2LGC) and then the North Thames Collaborations for Leadership in Applied Health Research and Care (NIHR funded CLAHRC) (BH Ref: 52AZ95). LJMO’s post is supported by Great Ormond Street Children’s Charity (G25 513947 2LGC) and Marie Curie (Grant MCCC-FCO-16-U). MBL’s post is supported by funding from The True Colors Trust (grant code G25 511830 2LGA). EB and PS’s posts are funded by Marie Curie (Grant MCCC-FCO-16-U). LJ was also funded by Marie Curie (Grant MCCC-FCO-11-U). BFH’s post was supported by The Health Foundation (grant code G25 512881 2LAAB) and is now supported through a grant from the Oak Foundation (OCAY-14-574). ML was (in part) supported by the National Institute for Health Research (NIHR) Collaboration for Leadership in Applied Health Research and Care (CLAHRC) North Thames at Bart’s Health NHS Trust. This research was supported by the Health Foundation and the NIHR Great Ormond Street Biomedical Research Centre. Data sharing statement Data from this study are not publicly available in order to maintain the anonymity of participants, as per the ethical approval granted for this study.